This is the C-terminal domain of a family of eumetazoan proteins collectively defined as calmodulin-regulated spectrin-associated, or CAMSAP, proteins. CAMSAP proteins carry an N-terminal region that includes the CH domain, a central region including a predicted coiled-coil and this C-terminal, or CKK, domain - defined as being present in CAMSAP, KIAA1078 and KIAA1543, The C-terminal domain is the part of the CAMSAP proteins that binds to microtubules. The domain appears to act by producing inhibition of neurite extension, probably by blocking microtubule function. CKK represents a domain that has evolved with the metazoa. The structure of a murine hypothetical protein from RIKEN cDNA has shown the domain to adopt a mainly beta barrel structure with an associated alpha-helical hairpin. The CKK domain occurs at the C terminus of a family of proteins collectively defined as calmodulin-regulated spectrin-associated (or CAMSAP) proteins. CAMSAP proteins carry an N-terminal region that includes a CH domain, a central region including a predicted coiled-coil, and this C-terminal CKK domain which is involved in binding CAMSAP proteins to microtubules [(PUBMED:19508979)]. 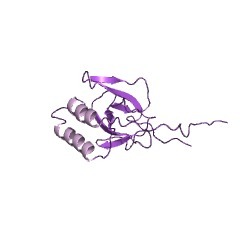 The structure of the CKK domain is a beta-barrel with an associated alpha-helical hairpin. Characteristically, the CKK domain has a single invariant tryptophan residue within the core of the predicted beta-barrel. Residues that interact with this Trp to form part of this core are highly conserved too. There are 2587 CAMSAP_CKK domains in 2585 proteins in SMART's nrdb database. Taxonomic distribution of proteins containing CAMSAP_CKK domain. This tree includes only several representative species. The complete taxonomic breakdown of all proteins with CAMSAP_CKK domain is also avaliable. Click on the protein counts, or double click on taxonomic names to display all proteins containing CAMSAP_CKK domain in the selected taxonomic class. The CKK domain (DUF1781) binds microtubules and defines the CAMSAP/ssp4family of animal proteins. We describe a structural domain common to proteins related to humancalmodulin-regulated spectrin-associated protein1 (CAMSAP1). Analysis ofthe sequence of CAMSAP1 identified a domain near the C-terminus common toCAMSAP1 and two other mammalian proteins KIAA1078 and KIAA1543, which weterm a CKK domain. This domain was also present in invertebrate CAMSAP1homologues and was found in all available eumetazoan genomes (includingcnidaria), but not in the placozoan Trichoplax adherens, nor in anynonmetazoan organism. Analysis of codon alignments by the sitewiselikelihood ratio method gave evidence for strong purifying selection onall codons of mammalian CKK domains, potentially indicating conservedfunction. Interestingly, the Drosophila homologue of the CAMSAP family isencoded by the ssp4 gene, which is required for normal formation ofmitotic spindles. To investigate function of the CKK domain, humanCAMSAP1-enhanced green fluorescent protein (EGFP) and fragments includingthe CKK domain were expressed in HeLa cells. Both whole CAMSAP1 and theCKK domain showed localization coincident with microtubules. In vitro,both whole CAMSAP1-glutathione-s-transferase (GST) and CKK-GST bound tomicrotubules. Immunofluorescence using anti-CAMSAP1 antibodies oncerebellar granule neurons revealed a microtubule pattern. Overexpressionof the CKK domain in PC12 cells blocked production of neurites, a processthat requires microtubule function. We conclude that the CKK domain bindsmicrotubules and represents a domain that evolved with the metazoa.